A Flat Lap Grinder is designed to grind flat glass surfaces or smooth straight edges on fused glass pieces. 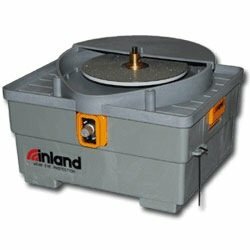 Unlike tabletop grinders, lap grinders are equipped with flat grinding or polishing discs. Laps come in various grits allowing heavy glass removal or surface smoothing operations to be carried out. Fiber polishing pads can be fitted. Different grades of diamond polishing compound can be used with these pads. This type of lap is designed to produce a very polished finish. Machine sizes vary from 4 inch laps up to well beyond 12 inches. The larger machines can be very expensive; some custom made models are available. Variable speed controls can be fitted on the more expensive units. It is possible to buy a combined flat lap and standard glass grinder machine with a normal upright small grinding bit. There is also a machine on the market that can be swapped between lap grinding and fusing glass saw cutting. Normally equipped with a water cooling system, recirculating, submersible water pumps can also be fitted to lap grinders. Ongoing lap replacement costs can be expensive as the laps are diamond coated. Subject to the type of work undertaken a wet belt sander can be a better option. Wet belt sanders can do many of the functions of lap grinders, it is a question of which machine is best suited to your needs. Sanding belts are cheaper than replacing diamond discs. Care needs to be taken with smaller wet belt sanders, as they are not suitable for heavy duty grinding. Many glass artists get by with just a tabletop grinding machine to handle their glass fusing kiln creations. It very much depends on the nature and size of the fused art glass items being produced. Normally 120 volts for home use, there are international 240 volt flat lap and wet belt sander models available through various suppliers.